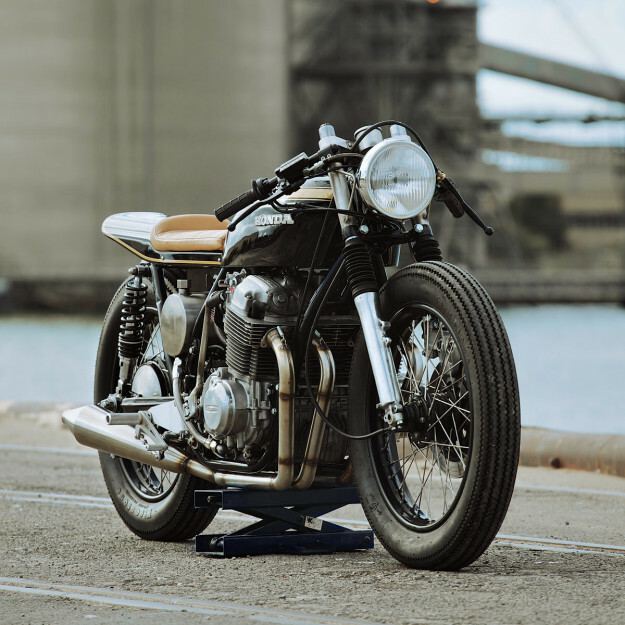 Glory Road Motorcycles is a small retail space that’s just opened in the heart of Adelaide, Australia. 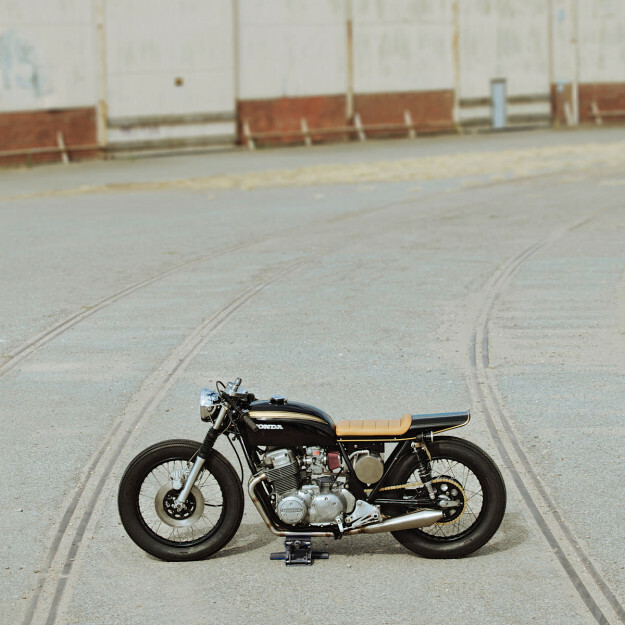 Step inside and you’ll find apparel, riding accessories—and some fine motorcycles, like this Honda CB750K. The shop is new, but owner Tom Harrison has been turning wrenches since the age of 17—when he left school to work at a garage specializing in Minis. 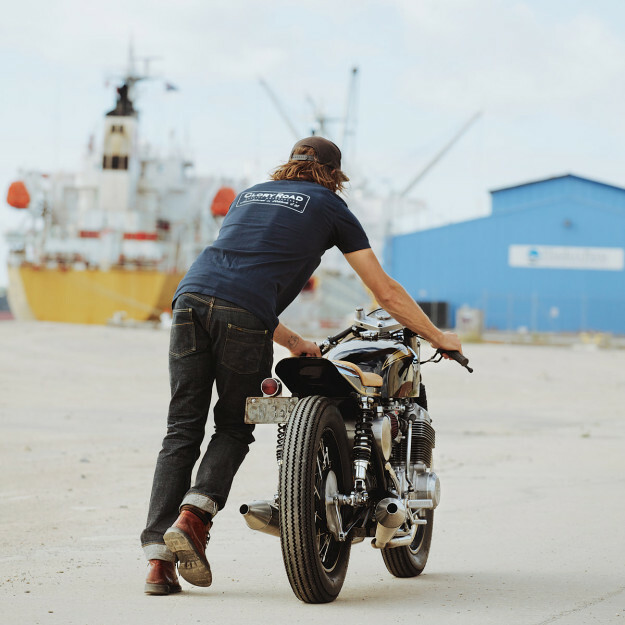 For the last couple of years, he’s been building bikes under a tiny carport in the ‘burbs. Tom’s acquired enough skills over the years to handle all the fabrication himself, outsourcing only the paint and trim. Which explains why this sleek, boat-tailed ’73 CB has a look that sits somewhere between handcrafted and factory. 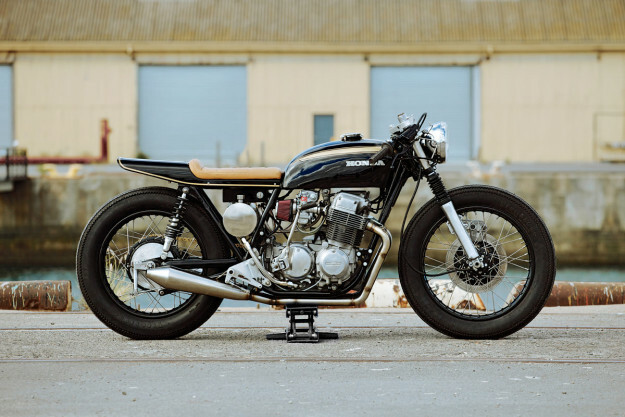 Originally bought as a wreck, the CB750 was one of the first builds on Tom’s bench—but it took a back seat to more pressing projects. Now, much to our delight, he’s finally finished it. The fuel tank is stock but the beautiful tail unit is new, shaped from sheet metal. Tom started by trimming and reinforcing the rear of the frame, and making a new seat pan. The seat is neatly covered in tan waterproof leather. Underneath it, the stock side covers, oil tank and air box have all been binned. 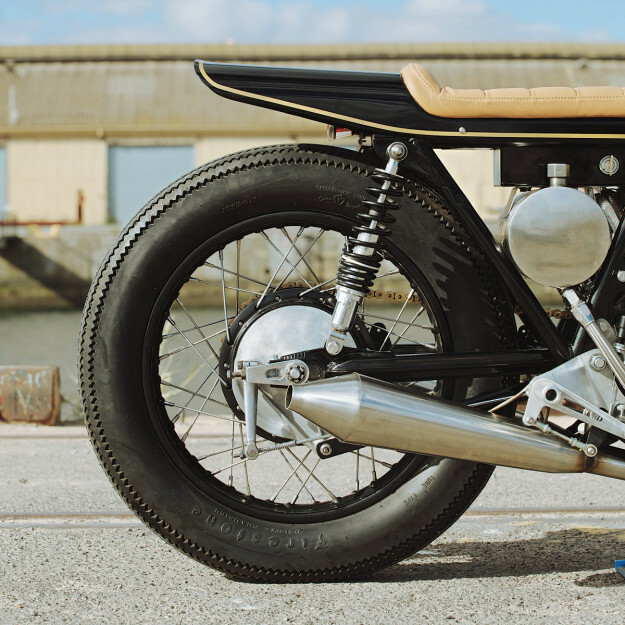 The space is now shared between a new battery box and an elegant, handcrafted oil tank. Just ahead is a row of Keihin CR carbs, fed by K&N filters. Tom’s stripped and rebuilt the engine itself, fitting an 830cc piston kit and a new cam for extra oomph. The cases have been water-blasted clean. 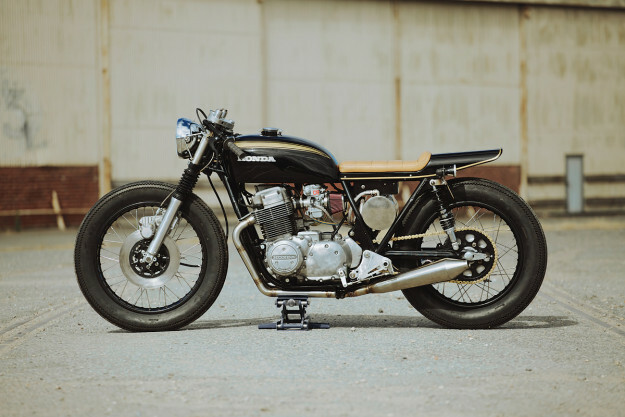 The highlight of the build is undoubtedly the stunning, four-into-two exhaust system. Tom’s bent the stainless steel headers to trace the shape of the frame, and then hand-rolled the mufflers himself—TIG welding everything. We’re sure it sounds just as good as it looks. Up front, the forks have been lowered slightly, held in place by CNC milled aluminum triple clamps. Steering is via a pair of clip-ons, matched to rear-set pegs mounted on CNC milled brackets. Rounding off the cockpit is small speedo, and a chrome headlight held by custom mounts. A small taillight’s been fitted at the back on a side-mounted license plate bracket. The wheels have been rebuilt with new stainless steel spokes, and the hubs and rims powder-coated satin black. Critics rejoice: the Firestone Deluxe Champion tires that are currently fitted will soon be replaced by Avons. Finishing the build off is a paint scheme as classy as the mods themselves: black, with OEM decals and badges. 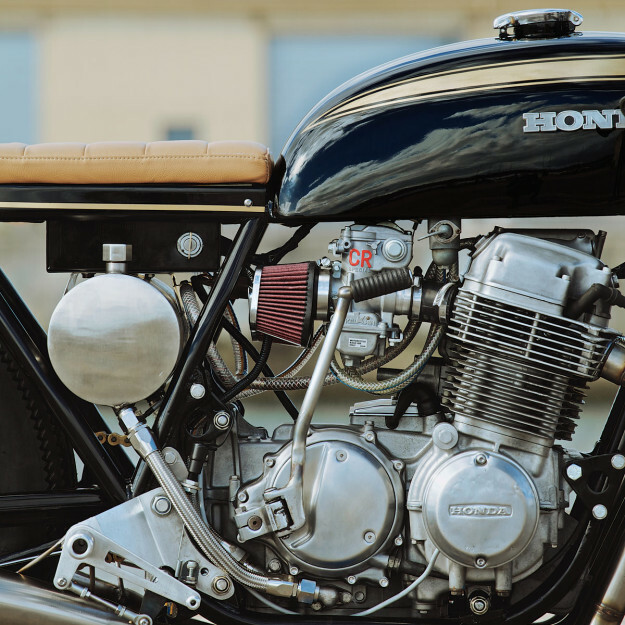 Could you think of a better livery to drive home the Honda’s vintage vibe?